It's a Bird! It's a Plane! It's a Kuhn Flexameter! This strange little device is obscure, but has a wonderful pedigree. It is the famous, eh not so famous Flexameter. Never heard of it? Does Wetzlar ring a bell? Hopefully so. Does Kuhn ring a bell? Probably not. daughter of good ol' Ernest Leitz II, President of Leitz and co-father of the Leica with Oskar Barnack. Elsie's married name was Kuhn. 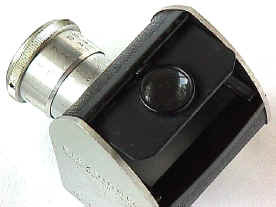 She and her husband settled down in, of all places Wetzlar, and were in, of all things, the camera accessory business. 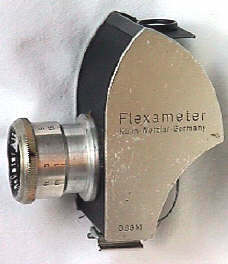 Their little company produced this gem of a device, the Kuhn Flexameter in the mid-1930's. groundglass. Besides a groundglass image, the Flexameter can provide low angle viewing, and held over your head, framing for above the crown or above the fence shots. 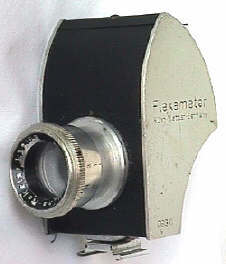 This idea of low angle rangefinder framing would be expanded on a mere six decades later by the Voigtlander Angle finder. Not exactly an SLR, but Elsie and her husband might have been onto something. Who would have thought in the 1930's that the female of the family would foreshadow the downfall of the mighty Leica Rangefinder Juggernaut? My thanks to the famed Leica Historian Marvin "Killer" Moss for introducing me to the Flexameter pedigree. In 1999 the Flexameter was the subject of a "What's This?" article in the Leica Viewfinder. Revised: February 05, 2004. Copyright © 1998, 2000 Stephen Gandy. All rights reserved. Information in this document is subject to change without notice. Other products and companies referred to herein are trademarks or registered trademarks of their respective companies or mark holders.